Don't you love a moist, comforting dessert that tastes better the second and third day? Especially when the dessert makes enough for 12 people? A dessert that comes from years and years of tried and true baking with love in a Mother's kitchen? 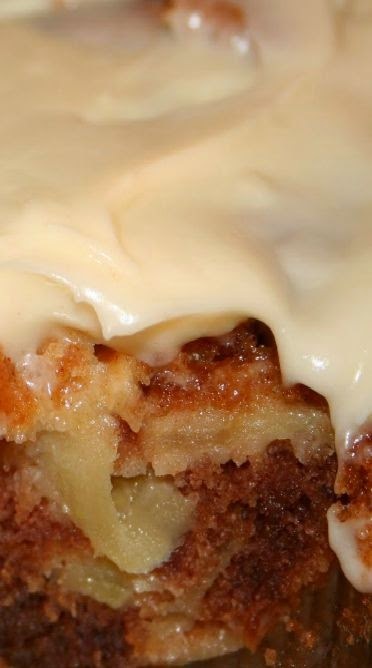 I adore my German apple cake with a light cream cheese frosting recipe just for all those reasons. Stuffed with apple slices, the cake tastes amazing. Cinnamon floats throughout as a mild but definitely present flavor and the cream cheese is not thick; just a thin coating, adding a delicious end touch. The recipe came from my baking friend Janeen's 90 year old mother and ever since the recipe has reached my kitchen (I have no idea how long ago that has been now), has continued in the tradition of being baked with love. Add vegetable oil to eggs in mixer and beat until foamy. Add the sugar and vanilla and mix. Now, add the flour, cinnamon, salt and baking soda. Mix together. Add thinly sliced apples by folding in with a spatula. The batter will be very thick but this is normal and there will seem to be more apple then batter. Again, this is what you want. Mix ingredients til smooth. Add a little milk if too thick.